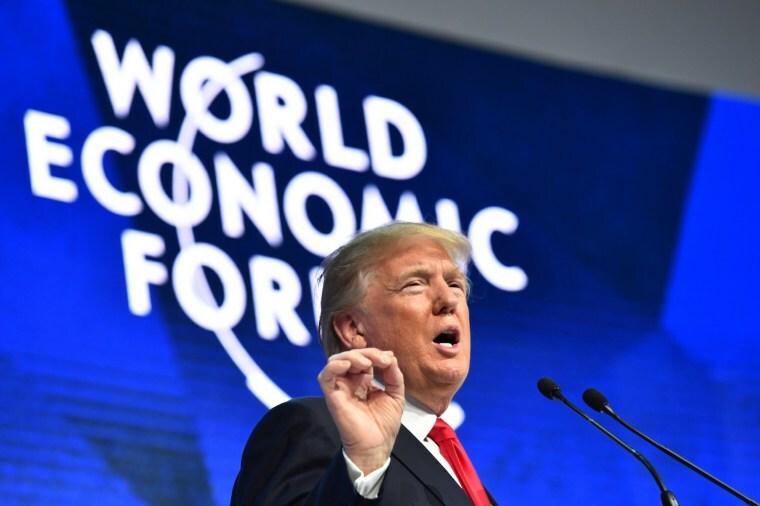 President Donald Trump used his speech Friday at the World Economic Forum in Davos, Switzerland, to invite foreign investment in the U.S. and insist that his "America First" vision doesn't equate with isolationism. "As president of the United States, I will always put America first, just like the leaders of other countries should put their countries first also," Trump, the first sitting president to address the globalist gathering since Bill Clinton in 2000, told the crowd. "But 'America First' does not mean America alone," Trump added. Pointing to his administration's successful push to cut regulations and enact a tax reform package, Trump told the group of foreign bankers and dignitaries that "there has never been a better time to invest, build and grow in the United States." "America is open for business," he said. Trump's appearance in Davos had raised eyebrows among the political establishment. Trump campaigned on, and in office has often tried to implement, protectionist and isolationist economic policies. He has criticized NATO, pulled out of the Paris climate pact and vowed to renegotiate global trade deals, leading many inside the American and world political classes to question what he stood to gain from spending time in the Swiss Alps with billionaire businessmen and the international elite. Trump attempted to answer those questions by connecting American economic prosperity to world economic prosperity. "When the United States grows, so does the world," he said. But he also drew on some of his campaign rhetoric, slamming "predatory behaviors" on trade — a nod to his stances against NAFTA and the Trans-Pacific Partnership. "We cannot have free and open trade if some countries exploit the system at the expense of others," he said. "The United States will no longer turn a blind eye to unfair economic practices." He also hit a familiar anti-media note: "It wasn't until I became a politician that I realized how nasty, how mean, how vicious and how fake press can be," he said. The comments prompted boos from members of the crowd. Trump also touted his just-released immigration proposal, saying the changes being proposed were "in the interest of economic and national security." His speech, a potential preview for parts of his first State of the Union address on Tuesday, capped a marathon two-day trip that included sit-downs with Prime Ministers Theresa May of Britain and Benjamin Netanyahu of Israel. In a brief appearance Thursday with May in front of reporters — their first since he canceled a trip to London to open the new U.S. Embassy there, blaming the Obama administration for selling the old building for "peanuts" — Trump said the two leaders like "each other a lot." With Netanyahu, Trump again touted his decision to recognize Jerusalem as the capital of Israel and to move the U.S. embassy there, from Tel Aviv. He also threatened to withhold foreign aid to the Palestinians if they don't enter negotiations with Israel on a peace deal.